When using relevant hourly rate to pay employees on a public holiday you need to select the appropriate number of hours for that day. For employees that work regular hours, the answer might be simple. But for casual employees and employees that work irregular hours, it might be more difficult to identify what is the correct number of hours to pay the employee. To better recognize relevant hours on a public holiday. 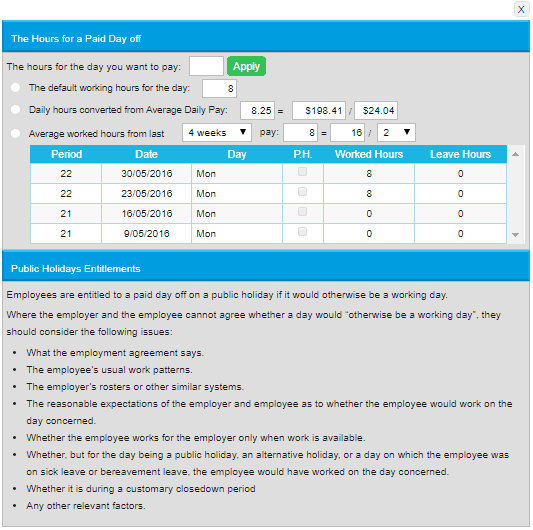 Crystal Payroll has added the information button next to the default hours box when you are entering time on a public holiday. Inside the information button, you are presented with information to better decide what the most appropriate hours are for the relevant public holiday.